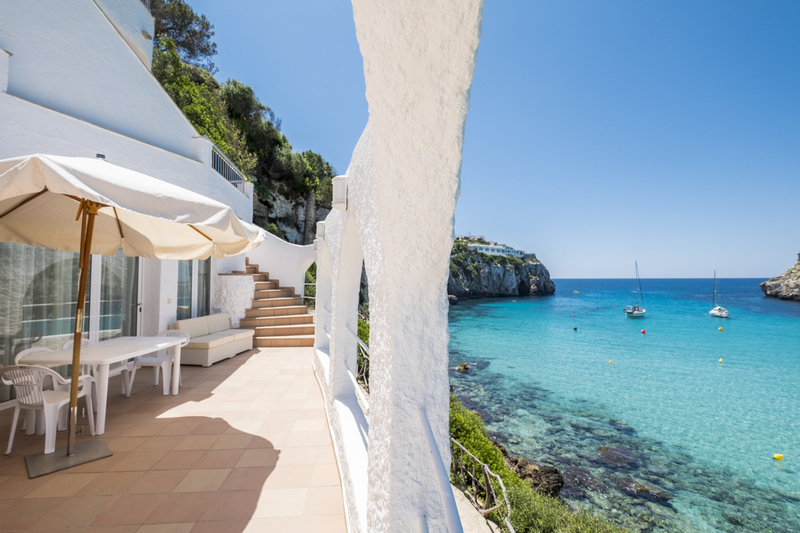 This villa is indeed in an unforgettable location, nestled into the rock cliffs of Cala en Porter, overlooking the sea. 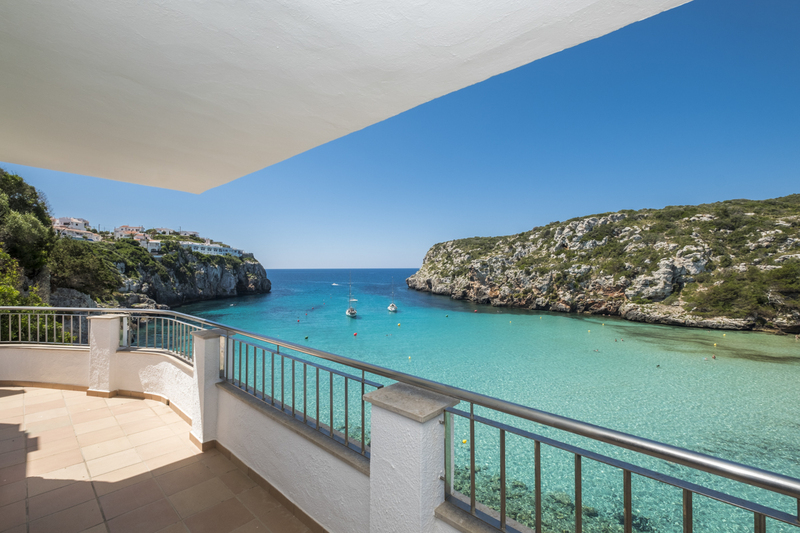 When you go out onto the terrace, you’re greeted with the beautiful colours of the cliffs, sea and beach, as well as the life bustling down on the beach! 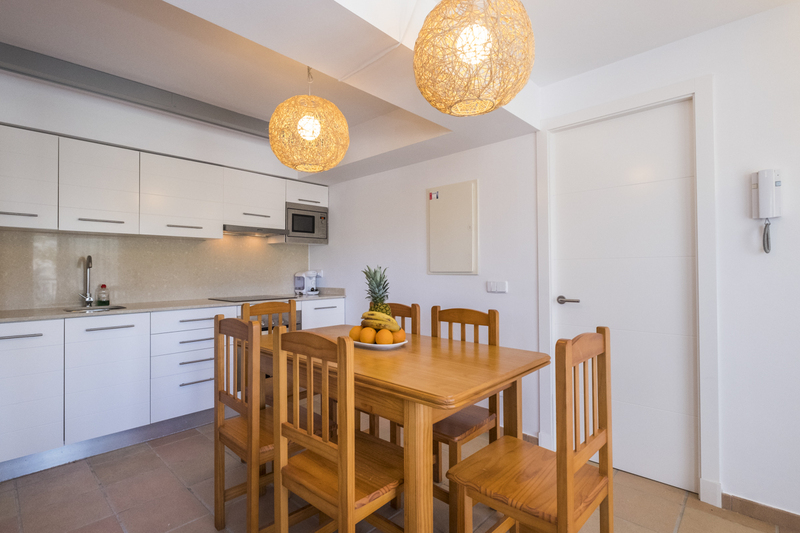 This is the perfect place for you whether you’re a family or a group of friends as you’re just a stone throw away from the beach! You have sun loungers at your disposal at the villa, and although you don’t have a private pool, you do have direct access to the sea! The villa itself is just as spectacular and comfortable offering plenty of room for you and your holiday party, and the maritime décor of the property suits it perfectly. The living room, dining room and kitchen is a modern open plan with all the necessary appliances, with plenty of space for you to gather and plan out your day or gather to eat as a group. 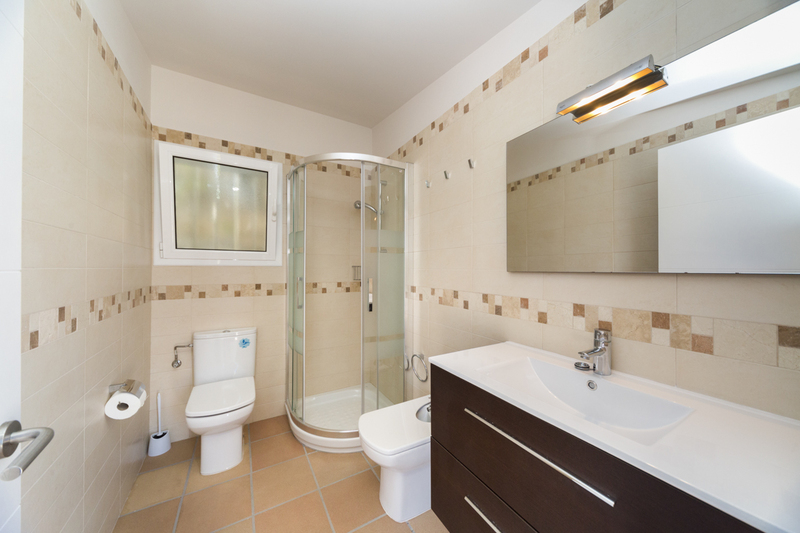 As well as this open plan section, the ground floor also has a bathroom, and from the living room, large doors that lead to the terrace which offer the most beautiful views. Whatever you decide to do out on this terrace, whether you sunbathe, play games or spend time with loved ones, you’ll have a postcard view to be the backdrop of it all. 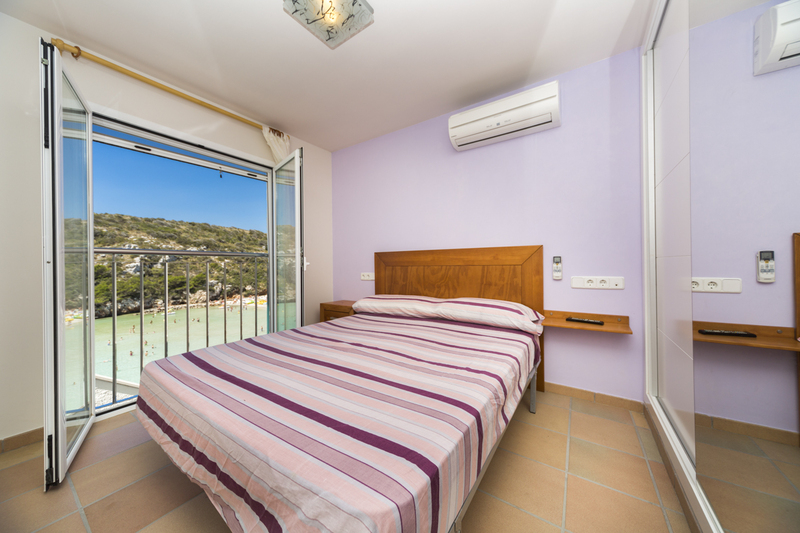 Over the next two floors are the rest of the bedrooms, with double beds and air conditioning, which you might decide is necessary due to the Spanish heat. 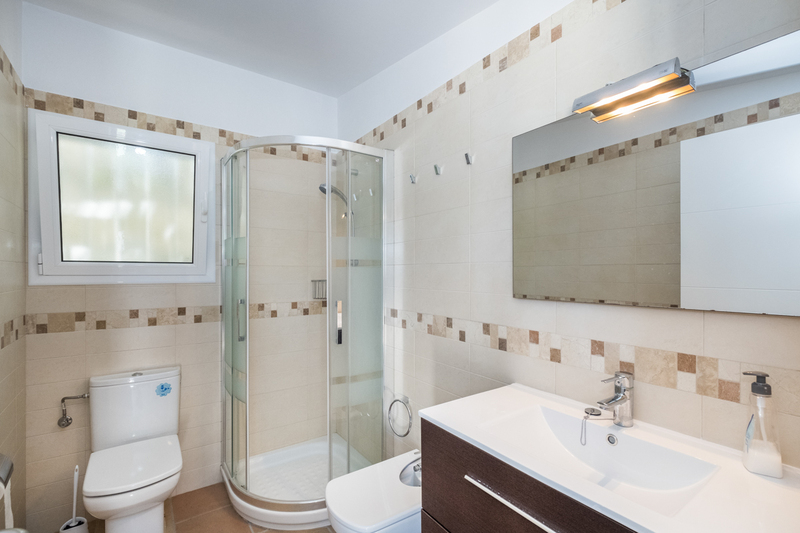 Each bedroom has clothes storage for you to use so you won’t have to live out of a suitcase – you can make this villa your home away from home! 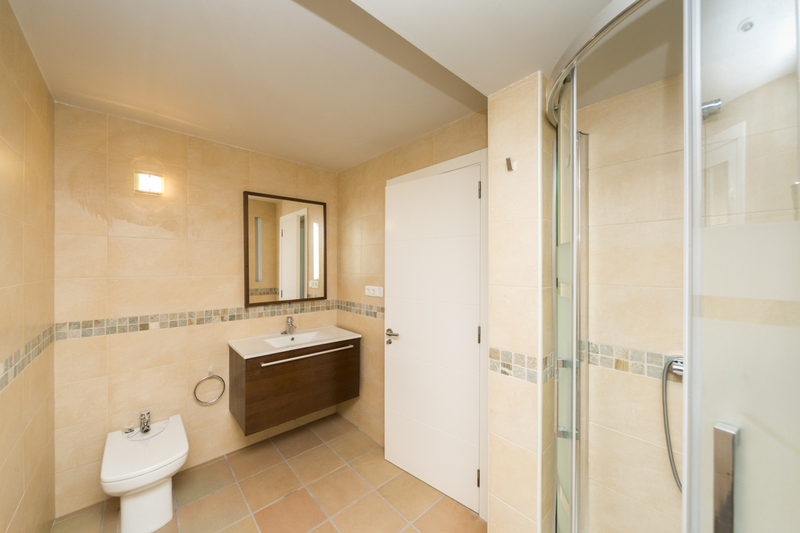 The bathrooms are all modern, continuing the classic colours of the villa, with showers and with two bathrooms, you won’t all need to fight over who uses it first. There is a more massive terrace that leads out from the second floor, perfect for use as a chill out area. 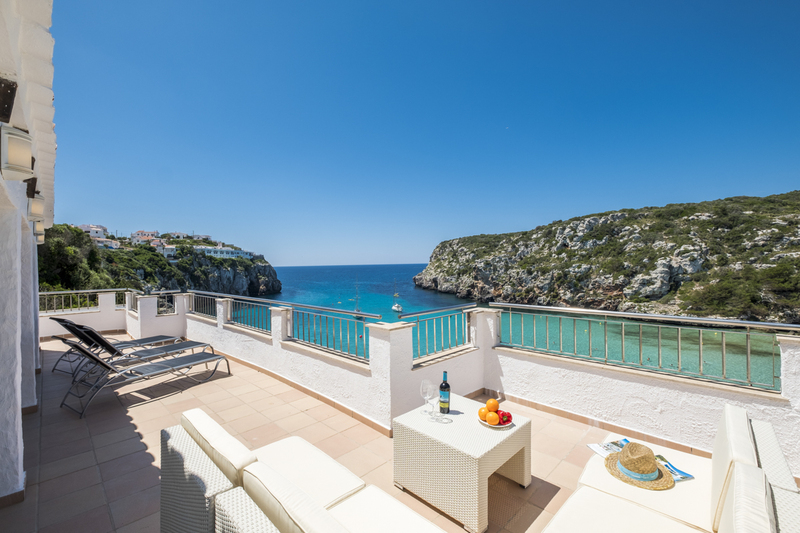 Whether your intention is to use this villa as just space to sleep or space to spend extra time during your holiday, you will have space here to do whatever it is you want on your beautiful holiday in Menorca. 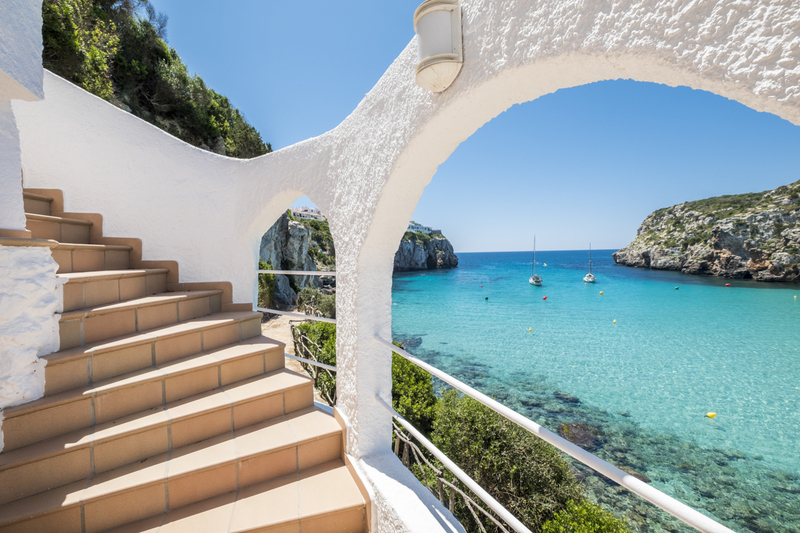 Menorca is a beautiful part of the Balearic Islands in Spain, rich with history and a seemingly endless supply of things to do, keeping you and your holiday party entertained. 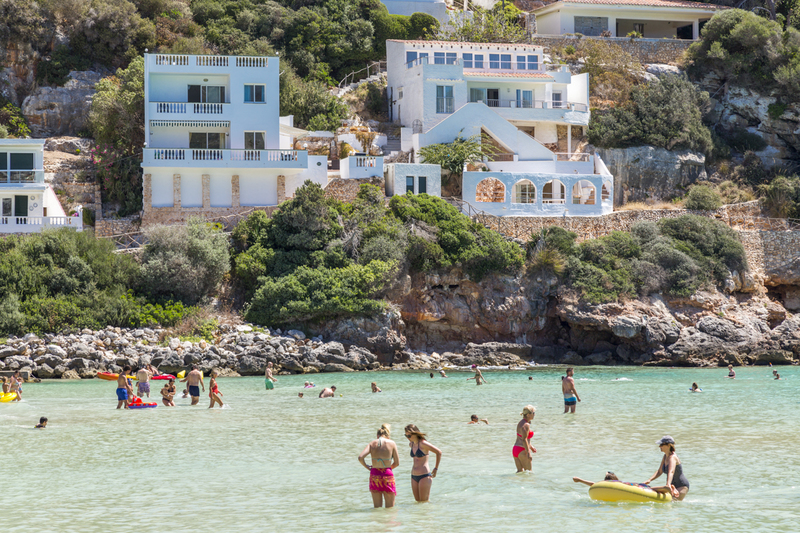 Whether you want attractions, food, shopping or spas, there are countless things for you to do. 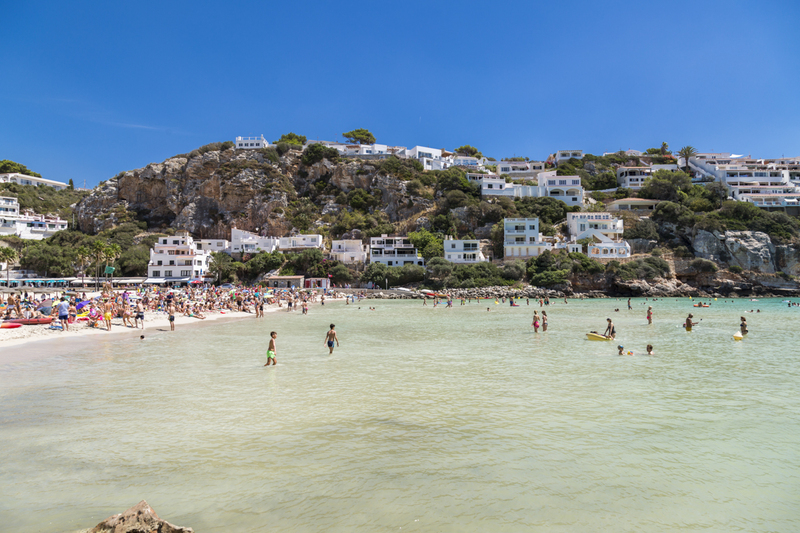 Cala en Porter is a beautiful seaside town, offering restaurants, supermarkets and even the potential for kayaking! 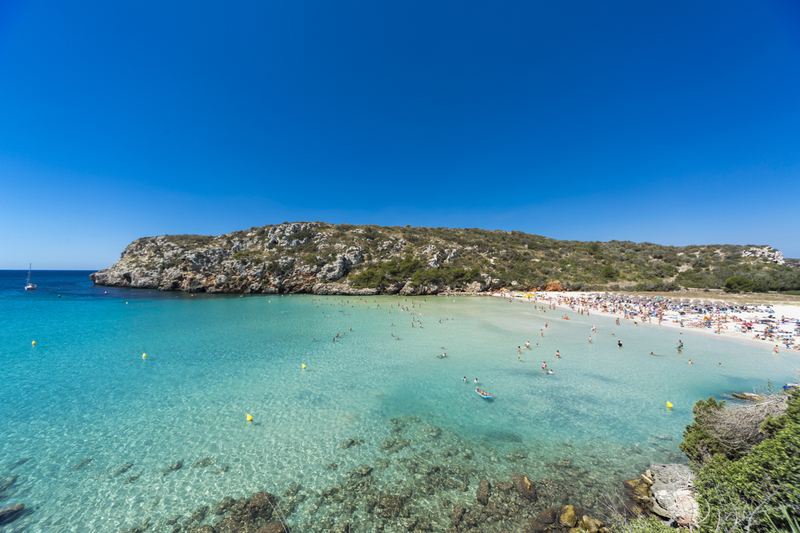 You have a beautiful sea to splash, swim and play in with your party, as well as the beach that will be bustling with life as the other holiday goers from around Cala en Porter will rush to this scenic beach for a day of relaxation and fun. 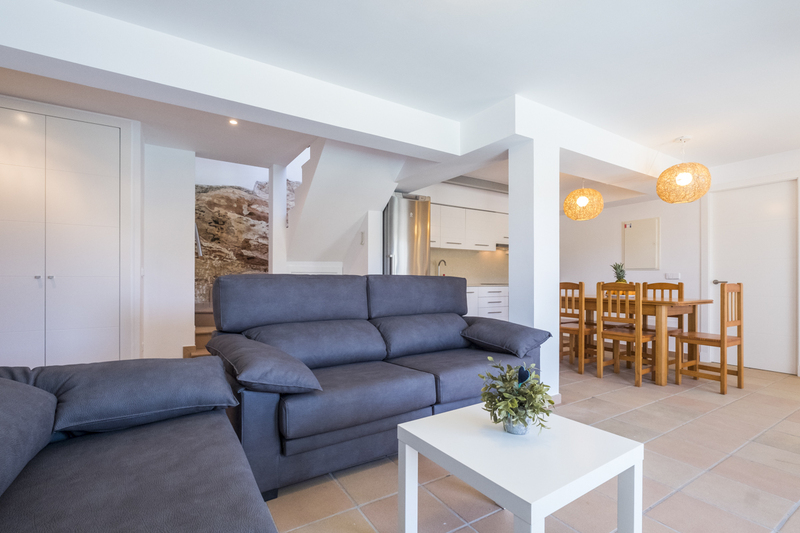 The supermarkets make it easier for you to stock up on the foods you want in your villa or allow you to create a picnic of sorts to take on your days out – eating doesn’t need to be a concern when you’re so close to them. However, if you do want to eat out, you have plenty of food opportunities right on your doorstep with the seaside bars and restaurants. You are also just a bus ride or a small car ride from Mahon. 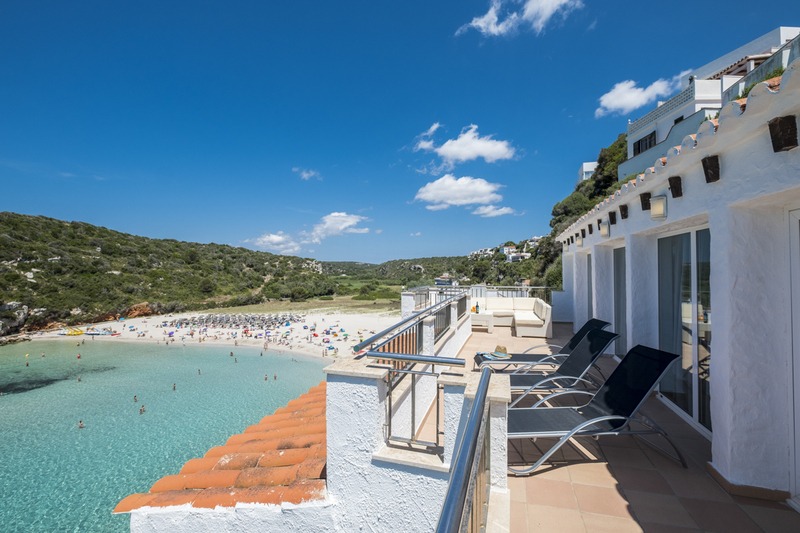 Mahon itself is the capital of Menorca and has plenty for you and your guests to experience. Stroll through Mahon and remember to look at the architecture around you as it has an unusual mix of styles, as well as experience the history by visiting the famous 19th-century fort, Fortalesa De La Mola – it has been very well preserved as is a loved attraction by many visitors to the island. The town is rich in its history. If you walk through the Arch de San Roque, you’ll be transported back as it’s the last part of the medieval town wall that is still standing in Mahon. As well as the standing history, you could take a trip to the Museu de Menorca and see the relics of the past from the history of the island preserved and on display. However, if you need a break from the sightseeing and history, you can take a break at the café’s and enjoy the food and drink on offer.